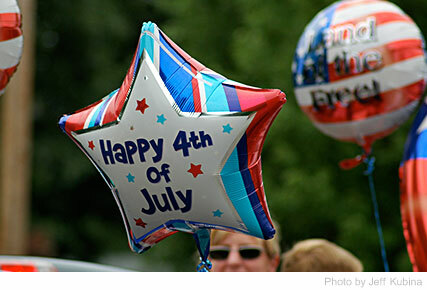 Are your kids excited about the Fourth of July? Red, white, and blue-themed crafts are a great way to pump up their enthusiasm for America’s favorite holiday! Get Dad and the kids to work together on these easy, fun crafts that double as party decorations. Take a red piece of card stock. Place the large star template onto it and cut out the shape with the knife. Take a white piece of card stock. Place the medium star template onto it and cut out the shape with the knife. Repeat the process with the blue card stock and small star template. Use the dot adhesive to glue the white star onto the red one and the blue star onto the white one. Cut out three 18-inch pieces of ribbon and fold each in half. Glue each piece of ribbon along with the Popsicle stick to the back of the red star and allow it to dry. Make sure you’re able to see the ribbons coming out from behind the star. Your Fourth of July Star Wand is ready to work some magic! Pour the paint on the plates. Dip your palms – one in each plate and make sure they are completely covered. Print them onto the white paper. Repeat the process. You should have four palm prints now. Allow the prints to dry and cut them out. Glue the palm prints together to make them look like exploding fireworks. Now glue the cutouts onto the black construction paper. Put some glue on the prints and sprinkle glitter. Allow your artwork to dry. Cut out two identical squares from card stock. Decorate or color one side of each of the squares. Glue the plain sides of the squares together. Cut the square halfway to its center. Gather the four corners of the square towards the center and insert a pushpin to hold them together. Make the hole slightly larger by wiggling the pushpin a little. Now push the pin into the button and wedge it into the pencil’s eraser. The button should be placed precisely between the eraser and the pin. This will make your pinwheel spin better. Your patriotic pinwheel is ready for Fourth of July!